Why a week of action? The Regional Comprehensive Economic Partnership (RCEP) is another "free trade" agreement currently being negotiated by 16 countries in Asia and Pacific - Australia, Brunei, Cambodia, China, Indonesia, India, Japan, Laos, Malaysia, Myanmar, New Zealand, Philippines, Singapore, South Korea, Thailand, Vietnam. The RCEP is expected to impact on the lives of 3.5 billion people living in the region. It has been negotiated in secret, so while certain corporate and business groups have been invited to the negotiations by government officials, ordinary people who will be most adversely impacted have had no say whatsoever. Come October 16, the RCEP will enter its 15th round of negotiations in China, where once again, women, civil societies and social movements will be shut out. Join us for NO RCEP Week of Action as together we raise our voices and call an absolute end to this unfair mega free trade agreement which would affect the livelihood of 50% of world’s population and increase inequality between countries, between the rich and the poor and between men and women. We invite national, regional and global civil societies, women’s organizations, farmers groups, trade unions and grassroots organizations to come together to rise and mobilize against RCEP. The easiest thing you can do is to post a picture of you (or with your friends/colleagues) that shows your opposition to RCEP using the hashtag #NoRCEP on Facebook and Twitter. Tell your government to not sign away your rights to corporations. Tweet to your country’s head of government, Minister of Trade or head of your government’s negotiations team. Click here for sample tweets and Twitter handles of government leaders. 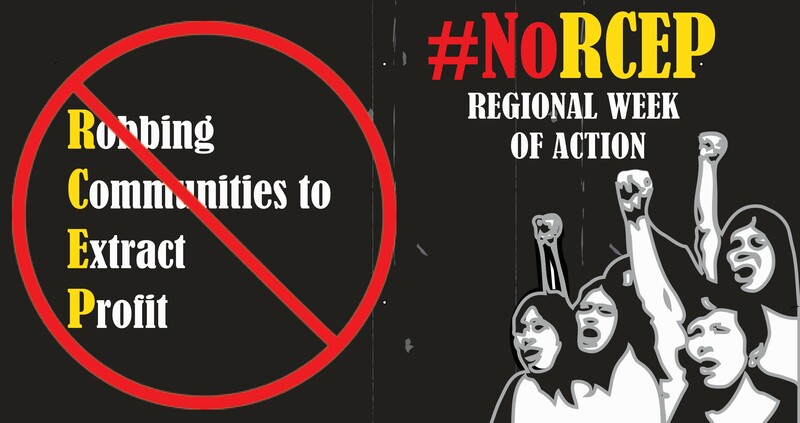 Change your Facebook and Twitter banner with the No RCEP Week of Action banner. You can also download our Take Action Toolkit for ideas about organizing your own local activity. Or join an event planned near you. If you are planning to write an Opinion Piece, Press Release, Statement or holding a Press Conference - you can find some talking points of RCEP here. Follow APWLD’s Twitter account @apwld as we share information on the dangers of RCEP. Don’t forget to submit your photos, videos, statements, planned activities and actions with us on the event page. Use the hashtag #NoRCEP so we can track and share them!